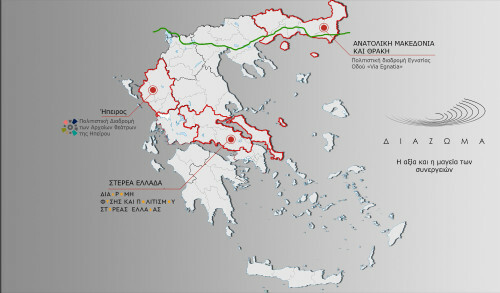 DIAZOMA’s development model implemented in Epirus, Eastern Macedonia and Thrace and Central Greece (Sterea Ellada). 2018 leaves us with a wealth of projects in three large Regions of Greece; above all, it leaves us with a legacy/precious intellectual heritage of a shared vision and the transmittable expertise of planning and implementing development projects that place monuments at the heart of life and sustainable development. A characteristic example is the Region of Central Greece (Sterea Ellada). On 07/12/2018, the Regional Governor of Central Greece, Kostas Bakoyannis announced through a call for proposals the launch of one of the largest cultural tourism programs in Greece, the “Cultural, Environmental, Tourism Route of the Region of Central Greece, total budget of 2.5 million euro and will be leveraging and activating works amounting to a budget of 80 million euro, via the PA (Partnership Agreement for the Development Framework), the Public Investment Program, as well as private investment. Utilizing ITI funding and the development of a network of synergies as a vehicle for the construction of one of the largest cultural tourism projects in the country, a new era for the Region of Central Greece is being shaped, step by step. In a holistic manner, this program combines attracting and developing tourism with utilizing the archaeological and environmental wealth of the region, whilst also encouraging the participation of the Region’s entrepreneurship. The Region of Eastern Macedonia and Thrace is moving along the same lines and in the same spirit, with a new and innovative program, the “Via Egnatia Cultural Route”, which is already being designed by the Region, Municipalities, the Ministry of Culture and DIAZOMA. The “Via Egnatia Cultural Route” is an Integrated Territorial Investment (ITI) Program within the framework of the Regional Operational Program 2014-2020 for Eastern Macedonia and Thrace and has a total budget of 55 million euro. Within the framework of constructing the Via Egnatia Route, a memorandum of cooperation was signed last January between DIAZOMA and the Region of Eastern Macedonia and Thrace. Recently, on 11/12/2018, the DIAZOMA Board of Directors unanimously commissioned a study for organizing the participation of the local economy in the Via Egnatia Cultural Route. A similar study had also been prepared for the Region of Epirus. It is a significant study, as its aim is to anticipate and determine the specifications of the body that will be charged with the management and operation of the Cultural Route in general. It should be noted that an operational partnership between local businesses and the Route is a prerequisite for the successful implementation of the Via Egnatia Cultural Route. The study commissioned by the Association provides for the detailed description of the methodology to ensure the active and quality participation of businesses in the Route. The blueprint for the aforementioned programs is naturally Epirus. The Region of Epirus remains a leading pioneer, after officially presenting the pilot development proposal “Ancient Theatres of Epirus Cultural Route” in November 2018 in Ioannina. This presentation was the culmination of a three-day event rich in visits and activities, with guests from both the local and international tourist industry, the sectors of culture, the letters and the arts, journalists, bloggers, Greek and foreign tour operators, all hosted by the citizens of the Region of Epirus. The DIAZOMA Association, continuing its support for the program, awarded two more contracts a few days ago, commissioning: a) the study “The role and operation of EPIRUS S.A. as the operator of the Ancient Theatres of Epirus Cultural Route”, aiming to define the strategic planning of the DMMO for the Epirus Route, and b) the design and implementation of an audio guide digital application intended to showcase the soundscape of the archaeological site of Dodona. Cultural Routes, making good use of the financial tools provided by the PA (Partnership Agreement for the Development Framework) 2014-2020, investing in a mindset of synergies and, most importantly, “adopting” our “common goods”, our cultural and environmental heritage, provide both expertise and act as a guide for the sustainable development of Greece’s Regions. The three aforementioned Regions implement all of the above in an exemplary manner, authentically embodying the European policies for tourism.